Due to the delay of my new 65 gallon tank cracking, the 40 gallon tank was used to hold those fish an extra week. My turtle, Tator will be moving into the 40 gallon tank from his 20 gallon tank. 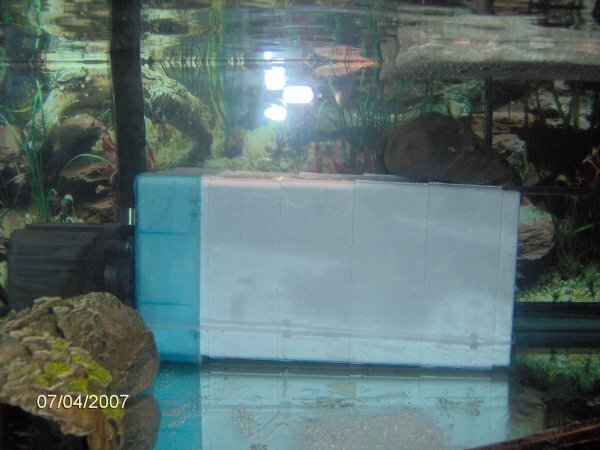 On 3/24/07, I taped six pieces of black construction paper to the bottom of the 40 gallon tank. The fish were in it waiting for a new tank. The paper is so that when the turtle goes in there, he will see there is some sort of a bottom to the tank since I do not want to add gravel. 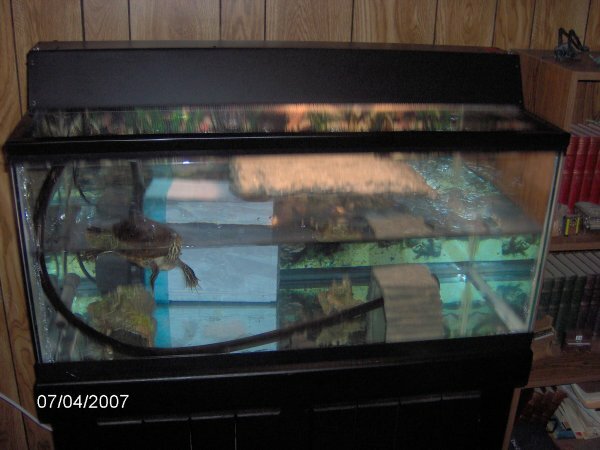 On 3/31/07, I moved my fish into a replacement 65 gallon tank. I then filled the 40 gallon tank with water with dilute bleach to disinfect and get rid of most of the algae. After two days of soaking, I drained and refilled with fresh water and dechlorinator. After a day of that, I drained the tank and let it dry for a day. On 4/4/07, I tried to add silicon to the seams. I say "try" because I did an awful job! It looks messy. I do not know if it will help hold water. It turns out that my pleco who was living in the 40 gallon for 8.5 years had eaten almost all the silicon out of the corners! Only the very corners remained. I do not know how it held water. The tank is also bowed at the top. Since it will only be half full for the turtle, I am hoping it will be okay. The tank glass has marks where the algae was so it does not look very clear. Maybe I should have bought a new one but not from the store that jipped me on the 65 gallon tank! I put a new backdrop on the tank. 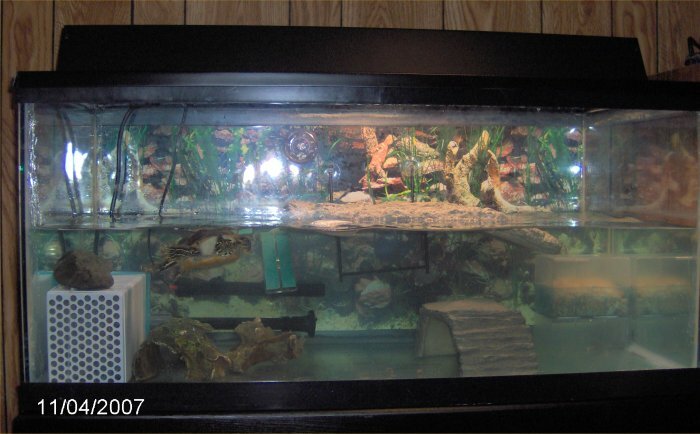 It will sit until 4/7/07 when I plan to move Tator into his "new' tank. 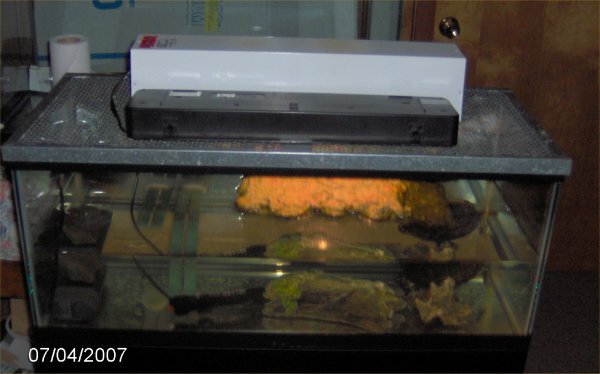 On 4/7/07, I moved Tator to the new tank. There were problems with my home-made filter system but I sort of fixed them the next day. When I first turned on the pump, it short water to the ceiling. So, I ran tubing all over the tank to try to staunch the extra water pressure. The next day, I simply took that off and turned the pump so the output shot underwater across the tank. I will add more on the tank inventory and details later (especially about my filter). For now, I will say that the tank setup includes the 40 gallon tank; backdrop; metal mesh lid; ESU combo light with 36" fluorescent Reptisun light, two incandescent daylights, and one incandescent nightlight; 100 W Visi-therm Stealth heater; air thermometer; 350 gph Mag-Drive pump with fountain head aimed across the tank; homemade filter made from filter boxes from work for pipette tips, held together with plastic cable ties; Zilla basking platform; large turtle dock; a few small rocks; and a few things from his old tank like the old baby turtle basking platform and the thing I was using to cover over his heater. 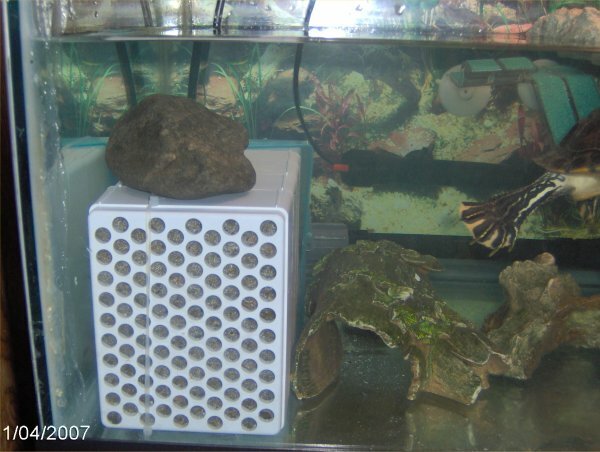 The filter has five chambers containing from first to get the water to last - pond filter material, a different kind of pond filter material, carbon in a mesh bag, ceramic beads in a mesh bag, and some bioballs. The pump intake is epoxied (not tightly with pond epoxy) to a hole in the last box. Last photo of 20 gallon turtle setup. The filter box from the side as I had it originally. 40 gallon tank on the first day. The filter - also Tator's foot on the right.